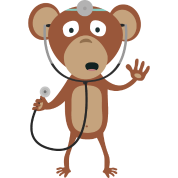 MedPriceMonkey is committed to better health care through informed decisions. Use our search tools to find a doctor or a procedure and compare prices. We are using real data to provide you a comparison of actual charged and paid prices to health providers throughout the United States. While the amount you may pay may differ depending on your health insurance plan, you can use the price comparison to see how your doctor compares to others in your area. We are continuing to build tools in order to make it easier to compare price and quality of medical services; we want your input. We will have a comments section soon. Right now, our procedures are broken out at the individual billing code (CPT code). We hope to bundle these codes so you can compare the complete cost of treatments such as the cost of surgery, cost of dialysis treatments, cost for diabetes treatment and more. Did you know that 50% of medical bills have mistakes? (Note, that is a made-up statistic but, seriously, there are a lot of mistakes.) Use our procedure search to find out what the billing codes (CPT codes) mean. Coming soon, you will be able to enter your billing information and have it reviewed instantly for errors.